What do birders do when it’s raining? Well, today I decided to bird indoors…at the art museum. In recent years, the Toledo Museum of Art has been featuring special bird exhibits every other spring, timed to align with the massive avian migration along the Lake Erie shore. 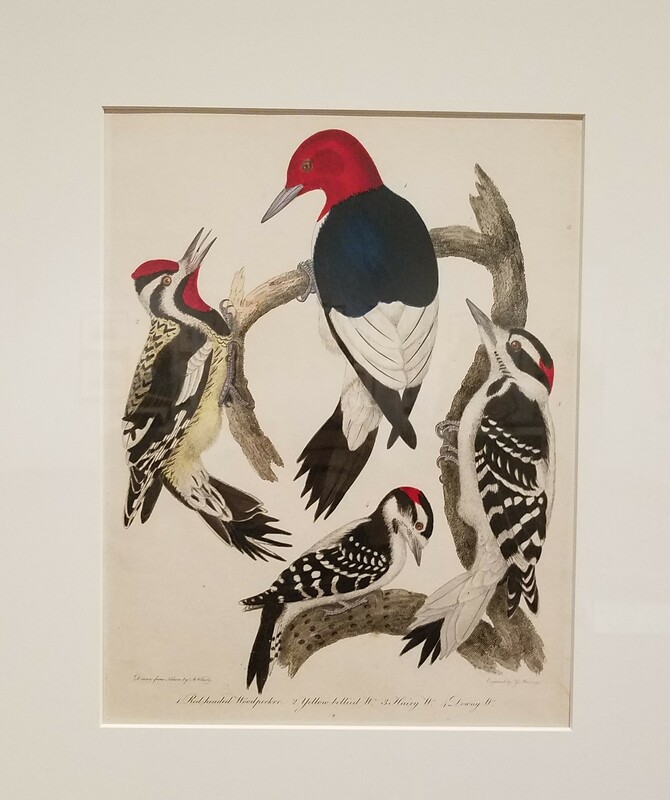 This year’s exhibit is called “Before Audubon: Alexander Wilson’s Birds of the United States.” It showcases the work of Alexander Wilson, who produced his massive 9-volume work American Ornithology before John James Audubon published his better-known The Birds of America. 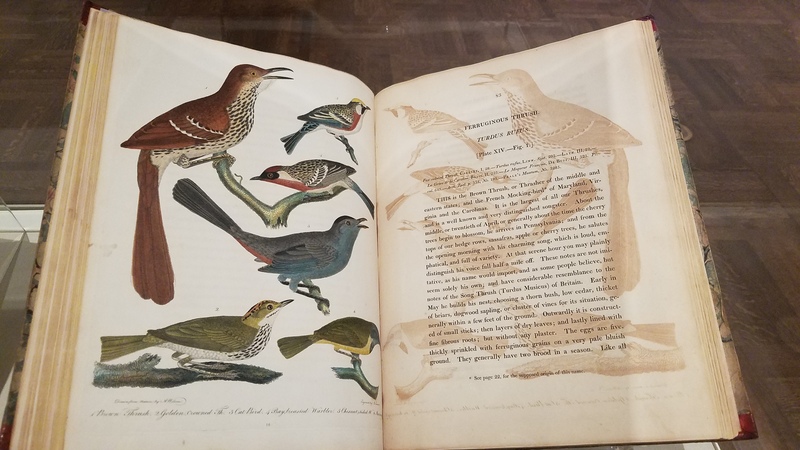 The image above shows pages from Volume 2 of the museum’s first edition of Wilson’s series, featuring the Brown Thrasher. I encourage you to enlarge the photo so you can read his text about this bird. And perhaps you’ll also be able to see that the eyes on the Bay-breasted Warbler and the Gray Catbird sparkle. As I looked through the glass case at this page, I first thought he’d placed gemstones as eyes, or maybe there’s glitter in the paint or something. I’m not sure how he did it, but those eyes seemed alive. Wilson was born in Scotland and immigrated to America after being imprisoned briefly for writing poetry about poor conditions in the mill where he worked. He settled in Philadelphia and became a teacher. His neighbor William Bartram became his mentor as he studied birds and learned to draw them. Of course some of my favorite images are of the woodpeckers. In the left image, he shows (clockwise from left) Yellow-bellied Sapsucker, Red-headed Woodpecker, Hairy Woodpecker and Downy Woodpecker. 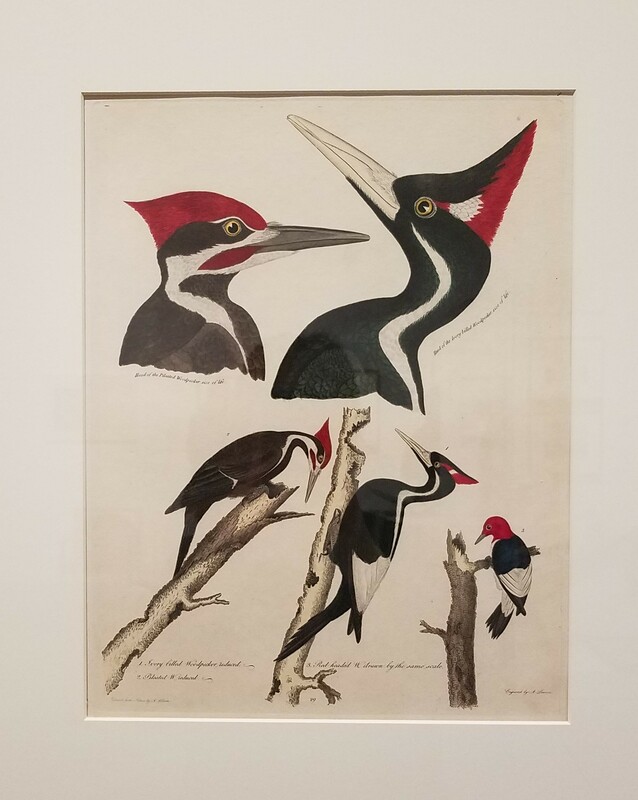 On the top of the second image he shows a Pileated Woodpecker (left) and the presumed-extinct Ivory-billed Woodpecker. Below their heads he shows them again, with a Red-headed Woodpecker for size comparison. With the exception of the Ivory-billed, all of these woodpeckers can be seen here in northwest Ohio. Wilson had helped to popularize ornitholology in America, and his approach had a strong impact in Europe, helping to renew the market for natural history studies. 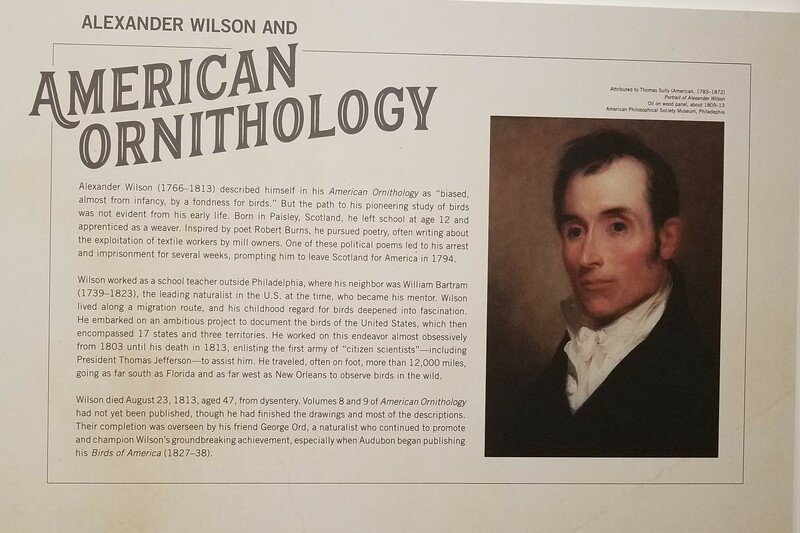 Consequently, Audubon was able to secure more funding than Wilson had ever enjoyed. The result was a luxury production, with plates printed and hand-colored on the largest paper available at the time (the double elephant folio) and each bird shown life size. The scientific community in Philadelphia–the publishing capital of the U.S. at the time–remained loyal to Wilson, forcing the “upstart” Audubon to publish Birds of America in London. I pulled out my copy of Audubon’s The Birds of America to compare to the images I’d just seen of Wilson’s birds, and I noticed a couple interesting things. First, Wilson’s birds are mostly shown without much surrounding habitat, and with multiple species combined in each image. Audubon’s birds, on the other hand, are usually shown as individual species in dramatic poses with detailed backgrounds of flowers and trees. And I’d never noticed before that the captions include the names of the flowers and trees in most cases. I’m so glad I discovered that. The museum’s exhibit explained that, due to financial concerns, Wilson put more species in each image to save paper costs. Clearly Audubon had no such constraints. Over the seven years Wilson worked to document birds, he traveled over 12,000 miles and had to overcome many difficulties. I went to Amazon and found a used copy of Alexander Wilson’s Life and Letters, and that tome is on its way to my eager little hands right now. I can’t wait to read about how he managed this groundbreaking accomplishment in the wilds of 18th and 19th century America. 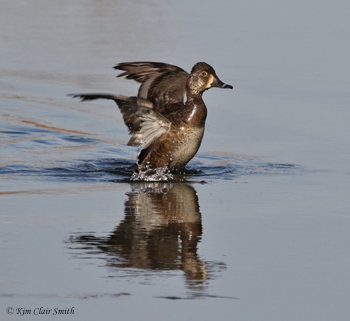 Fittingly, there are five bird species named after Mr. Wilson today: warbler, snipe, storm-petrel, phalarope, and plover. I’ve seen some Wilson’s Snipe recently here in Ohio, and am expecting to find some Wilson’s Warblers in the next few weeks as migration ramps up. And when I do, I’ll take a moment to remember the passion of Alexander Wilson and be grateful for his contribution to our knowledge and appreciation of birds. The Toledo Museum of Art is a real jewel in this city. Admission is free for everyone, all the time. And it’s only a 15-minute drive from my house, so I can go often. Sometimes I just drop in for a brief visit to stand in front of Van Gogh’s “Wheat Fields with Reaper,” because…well, because I just feel a need to do that. I’m grateful for such easy access to beautiful works of art and for the exhibits that teach me something new on every visit. Even though admission is free, I pay for membership each year to show my support for this organization that does so much for the quality of life here. Oh, my personal connection to this legend? Alexander Wilson and I were both born on July 6. I like knowing that. This entry was posted in Birds, Toledo and tagged Alexander Wilson, art, bird art, birds, John James Audubon, natural history of birds, ornithology. Bookmark the permalink. What an interesting history, Kim! It’s a special feeling to find some kind of connection with a “legend”, especially one who shares the same interest. His drawings are beautiful – he certainly was dedicated to do so much traveling – on foot in many cases, to document so many birds. We don’t often think of the work and dedication of these early scientists. Nice and interesting Kim. And the same birth date gives you something in common. Sounds like you had a good time seeing all the bird art work.